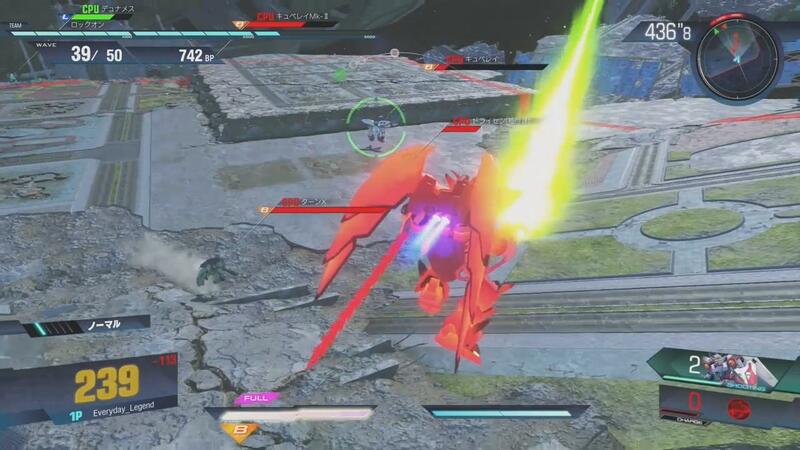 After multiple beta tests and public trial periods, the official Japanese release of Gundam Versus is finally here. 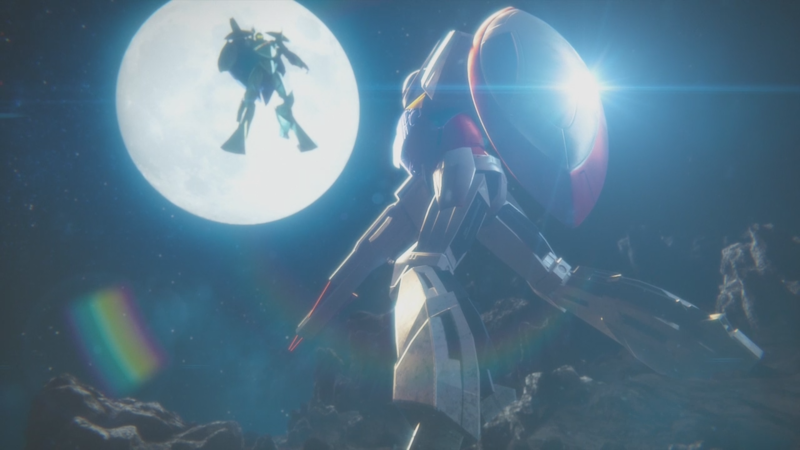 To say that I was excited for it is an understatement, as the previous game in the surprisingly long-running game series inspired me to delve into the vast ocean that is the Gundam metaverse, an adventure I’ve alluded to in a previous piece. I’ve spent enough time with the game to judge it on its merits as a completed product, and I honestly feel that my experiences with prior entries in the Versus series have imparted no bias or favorable slant. Instead, it’s given me the sort of perspective required for an analytical and critical eye on the game, one trained to see what works in its favor, and more importantly, what doesn’t. With that in mind, I’m glad to say that Gundam Versus gets an overwhelming amount correct, to the point where anything it doesn’t outright nail is rendered pretty insignificant. 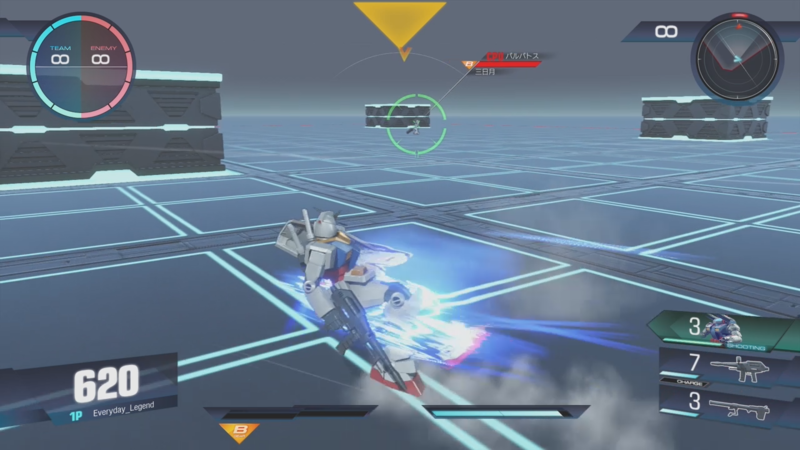 Upon Gundam Versus‘ start, the game installs to the hard drive in the background while you play a never-ending match versus CPU opponents, which gives the player time to quite literally play. I simply ran around and got a feel for how the game operated from the comfort of the RX-78-2 Gundam, the titular face of the 1979 classic that started it all, Mobile Suit Gundam. Once the installation was complete, the fight ended, and the opening splash movie began. I was then treated to a title screen with the game’s logo and the aforementioned O.G. Gundam — a cool little feature that always reflects whichever suit (giant mecha / robot) the player had previously piloted. From there, the menus offer quite a lot in terms of things to do, with multiple single-player modes that allow players to invite friends for online play alongside them. There are over 90 suits available at launch, and even more than that in the way of Strikers, which are limited-use assists that can give you an extra angle of attack during gameplay. Furthermore, while the suits are all open from the start, the Strikers are not, and must be unlocked by earning experience with each usable suit. It’s not just Strikers, either — accoutrements such as titles and emblems to decorate one’s Player Card (your visible online badge) are available, as well as alternate pilots and Navigators, which are characters that give you strategic advice in-game. Even though they do help to let you know when someone is locking onto you or is approaching from behind, I found their constant chatter to be a major distraction, so I simply elected to not have one. Gameplay seems largely the same as previous titles in the series, with the addition of two distinct mechanics, the first of which being Boost Dive. This allows you to sacrifice some Boost Meter (which powers not only jumping, but high-speed movement options such as dashing and dodging) to make a fast-drop descent from any elevation, which would normally leave a player woefully exposed to enemy fire while in mid-flight. This can also be combined with the Boost Step dodge mechanic to create an arced drop, and that makes for some devilish evasion tactics that prior games simply didn’t allow. The second new addition isn’t as glamorous, but it’s certainly functional: the ability to set a button that only targets the enemy closest to you. This alone has saved my bacon on multiple instances, and I cannot fathom playing without it now. It’s more than helpful, it’s necessary. All that said, Gundam Versus does feel substantially slower than previous entries, and that’s not a bad thing, especially when considering that this is likely to be the series’ introduction to many Western players. There’s a ton of online modes, and the netcode seems pretty stable, enough so that I was playing matches over the PS4’s Wi-Fi connection without issue. When wired, the game played flawlessly even against Japanese opponents, which was very rare in Full Boost. Casual Matches (random unranked) and Player Matches (lobbies) are present and accounted for, with Ranked Matches being enabled at the end of July. Surprisingly, there’s a Replay Room where you can relive or analyze your greatest (or worst) performances, but there doesn’t seem to be any way to spectate matches in progress, which is sorely missed. The largest surprise for me was that the game — which is currently import-only until its Western release on 9/29 — allowed American accounts to play online, seeing as how the previous entry in the series forced you to have a Japanese PSN account in order to redeem the online pass from the Japanese storefront. Now that PlayStation Plus is the only limiting factor, I was concerned that I’d need to subscribe for three months of Japanese PlayStation Plus to play online…and let me tell you, it was Brightest Timeline material to see that this wasn’t the case. Graphically, the game has never looked better, with the game’s engine bearing the fingerprints of the person responsible for Metal Gear Solid V: The Phantom Pain‘s visual fidelity. Suits truly come alive, little details are present and stand out, and the destructible stages look absolutely fantastic. Sound effects are spot-on from the series’ history, and voice actors reprise famous roles. The soundtrack deserves special mention, especially seeing as I imported Gundam Versus‘ Premium G Sound Edition, which gives over thirty more licensed music tracks as options to use in-game. It won’t matter much to the average player, but to a Gundam series fan, it means a lot. Some of these songs are guaranteed to make any Gundam fanboy go full Newtype during a match. Add in a movie mode that shows little clips alongside information per-series, and any new player can get quickly acclimated to the universe in play, while any dyed-in-the-wool Gundam fan will appreciate the refresher. With over 90 suits available, you’re sure to find something that hits your playstyle. There’s also a Tutorial Mode, but I didn’t really see the point in it, since it can tell you to do Action X and yet still pass you for doing Action Y, which doesn’t really teach anything useful when it comes to actually playing. There’s also notable holes in the roster, with some Gundam series missing representation entirely, such as G Gundam, Gundam X, Gundam AGE and Gundam 0080: War in the Pocket, for starters. This can only mean one thing: massive amounts of DLC in Gundam Versus‘ future. 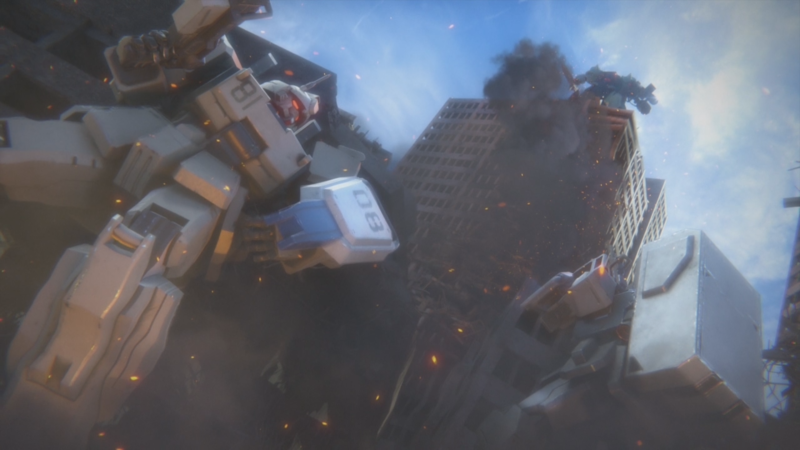 Full Boost had launched with over 90 suits from the start, and while Gundam Versus actually launches with one or two more than the previous game’s base roster, nearly 40 suits were released as DLC for Full Boost. I fully expect to see the same thing happen here, and it should come as no surprise when it does come to pass. Whether or not a player finds adequate value in all that piecemeal post-launch content will depend greatly on how much time they invest into the game. I personally spent well over 1500 hours in Full Boost, so a final price tag of $150 didn’t really bother me in terms of cost-to-benefit, but players that aren’t as dedicated will certainly feel a stronger burn in order to play with some of the series’ best suits. All in all, Gundam Versus isn’t a perfect game, but damn, does it get close. In terms of value over time, you have immediate access to an arsenal of suits, all of which play a little differently in terms of application. It’s a 2v2 battle game that somehow manages to never feel stale, and that’s a pretty amazing feat. If you’re on the fence, get the hell off of it and buy this game already. If you’re dead-set on waiting, pick it up September 29th, and I — among others — will be sure to greet you with three months of practice at our backs. Put it like this: we’re very likely having a lot more fun than you are right about now, anyway. You should jump in with the rest of us. 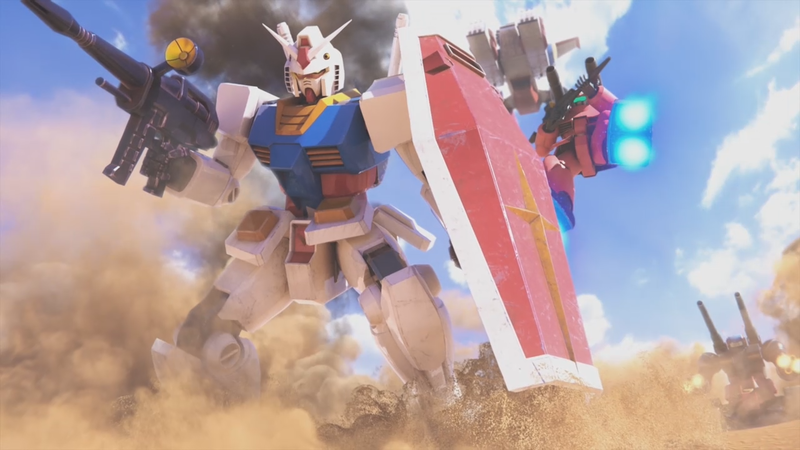 Gundam Versus is more than just another anime-themed licensed game, it’s very likely the sleeper hit of the year. It never seems to get tiresome, and there’s always something new to learn and figure out, but it does so in a way that never feels stale, frustrating, or boring. This is what all videogames should strive to be, and what little imperfections it has are mitigated by how much fun it is to play, especially with friends. Buy it right now. Disclosure: The review copy of this game was purchased and imported by the writer.